Silver Wartime Nickels were produced by the United States from 1942 - 1945. The coins were made from 56% copper, 35% silver and 9% manganese. This allowed the saved nickel metal to be shifted to industrial production of miltary supplies during World War II. 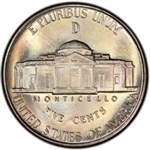 Each war nickel contains 0.0563 troy ounces of silver. Click on any item for more information including mintage figures for that year.